There are some buildings that have become icons of New York City. The buildings of Rockefeller Center, a national landmark located between west 48th to west 51st Streets between Fifth Avenue and Sixth Avenue, are definitely included. Their beauty and the deep affection they inspire comes less from their buff-colored limestone cladding and more from their creations of a lovely sophisticated yet warm urban space. The art, and art deco interior touches speak of a different and more gracious time. The original buildings were constructed between 1932 and 1939. Incorporating cutting-edge technology of the time, they offered high-speed elevators, central air-conditioning, and central heating. Interconnected via underground walkways and lined with shops Rockefeller Center was also one of America�s earliest malls, unique in the city. Originally conceived as an opera house by John D. Rockefeller, Jr. the project was supposed to raise the status of the district along 53rd and 54th streets. The market crash of 1929 ended that plan and Rockefeller was stuck with a long land lease. His luck changed in 1933. 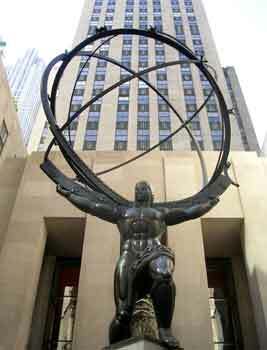 Radio Corporation of America (RCA) was looking for office space and Rockefeller jumped into the opportunity. By 1940 the RCA Building was surrounded by fourteen buildings of varying heights; additional construction through 1973 increased that number to twenty-one. Several of the newer buildings were created for different countries, including a set of four towers built along the Avenue of the Americas during the 1960s and 1970s. What the buildings lacked in architectural pizzaz they made up for in art and interior design. The Great Depression was in deep across the land and so the theme of the buildings human progress and the new frontier were incorporated in both text and art throughout the buildings. This theme is particularly clear in the monochromatic murals by Jose Maria Sert of Barcelona. Painted on canvas and glued to the walls, the theme of much of his work is progress over obstacles. They depict progress over slavery, illness and mastery over the world. 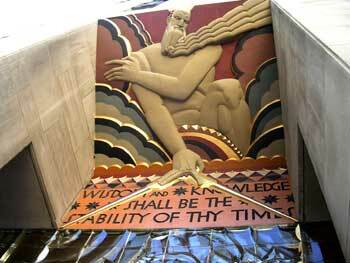 Today this may smack of grandiosity, but Rockefeller clearly sought to inspire. And incorporated enough art in his buildings to rival some of the world�s museums. Most passers-by admire the gold-leaf relief engravings of artist Lee Lawrie without realizing how much of his work graces the buildings. Not only did he create mighty Atlas keeping the world held high, he also contributed many of the friezes, jewels of carved sculptural elements on the buildings. Perhaps the most controversial piece of art was the short-lived fresco Man at the Crossroads by Diego Rivera created in the Spring of 1933. The story goes that Rivera, a Socialist, was commissioned to do the mural for the clearly Capitalistic Rockefeller but then, contemplating the reaction of the Communistic countrymen in Mexico began to think this might not be a good idea. 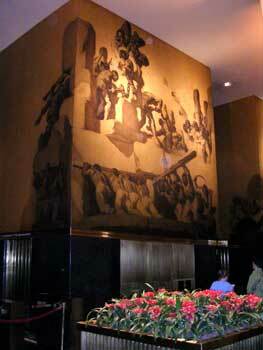 His solution was to make the mural so unacceptable that Rockefeller would cancel his commission. The plan back-fired when the Rockefeller approved the plans. However, when Rivera unveiled his creation it was so flagrantly anti-Capitalism, completed with an image of Lenin, that it was literally covered up for 9 months, and eventually destroyed. Rivera went back home and recreated the mural on the Palace of Fine Arts in Mexico City a few months later. It�s not known whether the incendiary nature of the original depiction was to make a political statement reflecting Rivera�s beliefs, or an attempt to get out of a commission that he found politically unwise. 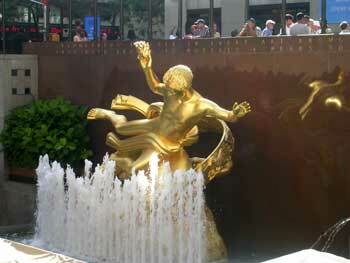 Rockefeller Center plaza is one of the city�s special places, and one of the most popular spaces. It was originally opened in 1933 as pleasant lure, encouraging shoppers to visit the stores of the lower level. When that didn�t work out as planned a roller-skating rink replaced the rest area. That too failed to induce people to visit the area. Finally, it became the tiny urban ice rink open from October through April and an outdoor caf� for shoppers, tourists and those who want to enjoy some dining al fresco. Gilded Prometheus, bringing fire to humankind, by Paul Manship presides over the ice-skating rink whether it�s filled with skaters or sitters. At the other end, the Channel Garden leads from 5th Avenue into the Plaza with plants and flowers and tiny waterfalls. In winter, Rockefeller Plaza, one of the very few privately owned streets in New York City, becomes a wonderland with the decorated windows of Fifth Avenue, the angles lit with tiny lights along the garden, culminating at the famous Rockefeller Plaza Christmas Tree. And when the tree isn�t there, you can see the plaque in the pavement indicating where it stands. An New York institution, Radio City Music Hall opened in 1932 is an Art Deco delight, beautifully ornate and lavish, and the nation�s largest indoor theater. The Associated Press building is announced by a stainless steel sculptural plaque, News, incorporated elements of that theme of news by Isamu Noguchi. Noguchi studied with Brancusi (whose influence can be clearly seen in this piece). The plaza in front is a popular place to sit and enjoy a beautiful New York City day. Rockefeller Plaza is now owned by Tishman Speyer, but with its status as a historic landmark, all of New York, in a sense, owns it as well.